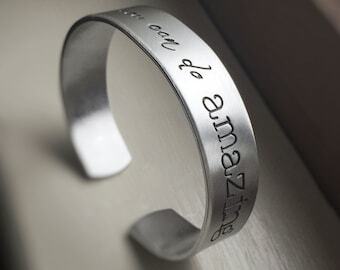 A 1/4" x 6" aluminum cuff bracelet is hand stamped by me with the text of your choice, up to 30 characters. The piece in the listing pictures bears the inspirational/motivational phrase "Actually, I Can". I give the aluminum cuff a brushed, matte finish. These thin 1/4" cuffs are perfect for stacking, I also have them available in brass, copper, or sterling silver, please inquire as there may be a price difference. My maker's mark is stamped on the inside end of the piece, making your piece a true RVD original! 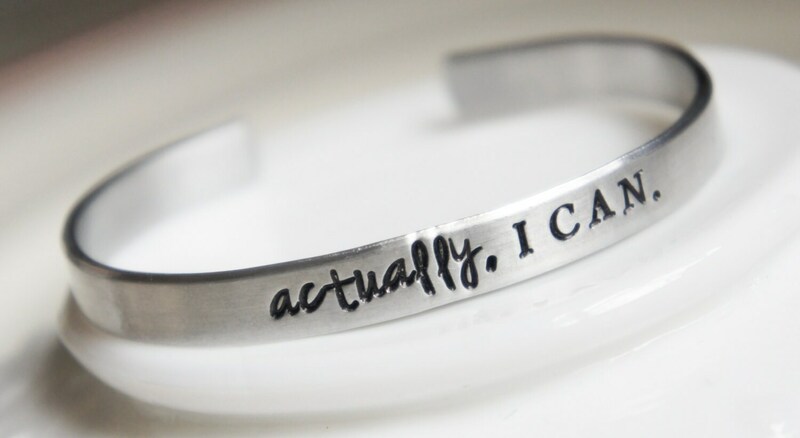 1) The text you'd like me to stamp on the cuff, up to 30 characters including spaces and punctuation. I can make this piece as a "hidden message" cuff by stamping your text on the inside, please specify if that is what you'd like. If no notes are left at checkout, I'll make and send the piece as shown in the above listing pictures. Your personalized cuff bracelet will arrive in a black velvet drawstring bag ready to give as a gift! Please contact me before purchase for current production time if time is an issue (current lead time can be found in my shop announcements at the top of the page here http://www.etsy.com/shop/RiverValleyJewelry?ref=seller_info_count ). Priority Shipping upgrade is available, but please contact me for a custom listing before purchase if you need the item shipped Priority.